Are you one of the biggest movies lover and want to create a theatre kind of atmosphere at your home? You can say that you have some ultra high-end TV’s to do so but they are not as impressive and dynamic like projectors. On the basis of resolution and projection display, projectors are hard to beat by any other device to experience. TVs generally occupies too much space, which is not everyone’s cup of tea, so to buy a best ultra short throw projector with distinctive features is an ideal investment. A perfect projector allows you to to watch your favourite movies, sports, games anywhere at your best time. Projectors have the capability to transform a simple living environment to an entertainment zone. Therefore, taking this into our mind, we have brought some best projectors of 2017 for you to help you out in choosing your favorite ones. Interesting thing about these projectors is that you don’t want to invest too much for them and these al are affordable and reliable for the people to purchase. If you want best in overall performance, Epson VS240 SVGA is surely your first choice. Its perfect color display, long life, decent price makes it allrounder in this list. It has a high-end resolution of 800X600 and it is adaptable with HDMI for digital as well as audio. The speciality of this ultra short throw projector, which differentiate it with other projectors is longest sustaining lamp live upto 10000 hours. If we talk about its other features, it sizes 14.5 x 13.8 x 6.2 inches and weighs 8 pounds that makes it convenient for transportation. You also have an option of instant one touch button as a sleeping mode that allows you to pause your video without turning it off. 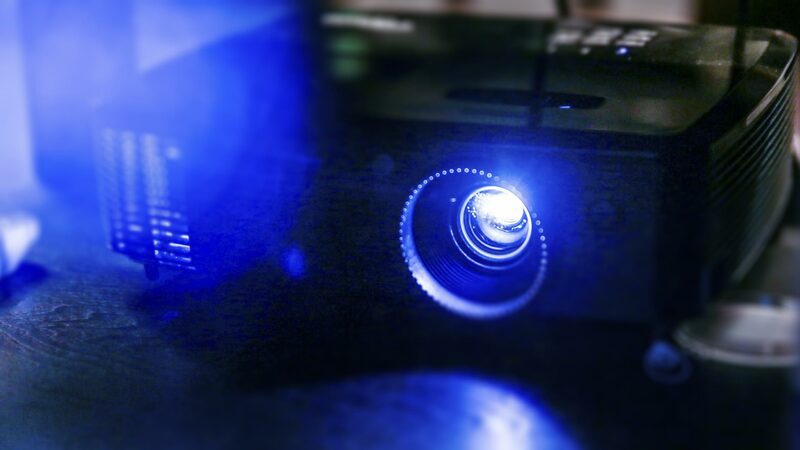 As far as its strengths, this projector is quite good to for entry level. You can both watch important presentations as well as movies and music videos. If your pocket, at present, do not allow to throw valuable money, then Optoma HD 142X is hard to beat as it has all the necessary features in a package. If you have less space to fill, HD 142 is perfect. It has 3000 ANSI lumens of brightness, so that you can see a clear picture and crisp picture that can be auto-adjusted according to the light. Fed up with big sized projectors? Don’t worry, DeepLee GM60A only weighs 2 pounds and sizes 5.8 x 7.4 x 2.1. It can even fix it to your palm means highly portable. On features concern, it comes with 800×480 resolution along with an aspect ratio of 4:3/16:9 and contrast of 1000:1. One of the highly dynamic features of this projector is its built in WiFi, which allows you to connect it with your iphone, smartphones, iPad and any wireless device like smart TV. DeepLee provides one year warranty for some parts as well as replacement of lamp for 90 days. Overall, it’s a pleasing device to purchase that comes in reasonable price plus portability factor. If you are keen to view robust display, then, this projector from ViewSonic is certainly the best among all in the list. Powered with Super Color technology and 15000:1 contrast, the image comes from the projector gives crystal clear view. Apart from it, this projector also has five view settings for more cinematic display or business presentations. Unlike other projectors, it combines with large speaker chamber with high-end amplifier. The only disappointment received from the user’s about this projector is its low resolution of 800×600. You will get three years of warranty on some parts and labour. For lamp, you will get one year insurance and exchange facility in the very first year. This is another mind-blowing ‘mini projector’ from iCodis. It offers 1080p resolution with 8.5 ounces, means it is also too small to fit in your palms. With extended LED life of 30000 hours, it has a projection display size of upto 120 inches. Powered by Android 4.4 and extended rechargeable battery upto 110 minutes are among its most amazing features. It is not just a movie projector, but you can also use it to showcase your business related powerpoint presentations. You can either connect it with your ipod or mini tripod for stable viewing. It can also connect with HDMI cable. If you want to go with advanced picture quality and media support such as blue-ray disks, BenQ should be your first choice. It has a resolution of 1024×768 and works on DLP (Digital Light processing). It has SmartEco technology to save power. If we talk about dimensions, it measures 28.3X 22.2X 9.5 cm. Two of the most exciting features of this projector include blu-ray playback with full HD 3D support and lamp save mode for less replacement cost. Epson EB-X31 comes with a blistering brightness of upto 3200 lumens along with a high contrast ratio of 15000:1 and dimensions of 37.5 X 17 X 36.8 cm. Its advanced i- protection application allows you to have a wireless connection, so that you can project images and files from your devices. One more interesting feature of this projector is a sliding horizontal keystone adjuster for easy and quicker screen corrections in limited space. You can also connect upto 50 terminals through multi-PC projection. Unic UC 40 Plus has a lot to offer you in lower price. It has a resolution ranges between 800×480. You can easily play movies, video games or high-end business presentations upto 130 inches image protection. It has supported with HDMI, AV and USB Ports. Lumens and contrast ratio of this projector is 800 and 800:1 that clearly signifies its high-quality display and presentations. If you are looking for a slimmer but powerful projector HD28DS from Optoma is just amazing. Firstly, it weighs only 5.7 pounds, so that you can easily carry it. 1080P resolution is combined with the brightness of 3000 lumens plus contrast ratio of 30,000:1. It also supports 3D video sources such as blu-ray players. Apart from its 10W speakers with crystal clear sound clarity, one unique point about this projector is its unique DarbeeVision Visual Presence video processing system which helps in getting enhanced digital images and videos with in-depth reality and depth. This projector is best choice for budget seekers. Measures 13.2x 4.6x 10.3 inches and weighs 4.6 pounds, Ocday 2800 projects a resolution upto 1280 x 768 along with the brightness of 2800 lumens. It has built-in-speakers supported by USB, AV, VGA and HDMI with fair amount of flexibility. It will surely blow your mind and stay you happy. So, here comes an end to this post that features some amazing budgeted projectors of 2017. I hope you would appreciate it and will choose one of these device of your choice after going through the specifications and features. Feel free to share your valuable thoughts on the same, we will get back to you.